I’m going to start here with a confession: My first impression of the Alameda Cafe, before I even sat down, was that it was full of itself. That’s pure stereotyping, I admit it. When I see white tablecloths, paintings of flowers on the walls, actual flowers on the tables, the staff wearing black, and bottles of wine in a display on the counter, I think “Great, welcome to Pompous Valley.” Had I looked at the menu and seen an omelet with blue cheese, benedict with chili-infused hollandaise, and French toast named for Santa Fe, I might have left. And then there’s the name: Alameda, synonymous with Old Money. Blech. Now, I wouldn’t exactly call the place down home, or cheap, and I’m still not sure what to make of its signature “French toast,” but I like it. When the food is good and the feeling is friendly, I’m okay with spending a couple extra bucks. I have found the service to be good, the wait nonexistent (even on a pleasant Sunday at 10), the bacon crisp and peppery, the potatoes big and chunky and oven-roasted, and the prices only about $1-2 above average for Portland. The Alameda feels like a cross between fine dining—it’s mostly a dinner place—and a neighborhood breakfast place with kids. It’s also a little bit French, and a little bit American Southwest. And therefore it suits the neighborhood perfectly. In fact, one reason I have a hard time putting my finger on this place is that I have the same problem with the Alameda neighborhood: Is it the grand homes along Alameda Ridge? Is it the streets north of Fremont without sidewalks? Yes and yes. Is it Stanich’s old-school burgers? Is it Starbucks and the Alameda Brew Pub? Yes and yes, again. Such is this cafe’s food, which is part stylish (the Southwestern Benedict also comes with sweet and spicy corn bread) and part, well, kind of down-home. You can, for example, build your own omelet with any three ingredients for $7.95 with potatoes and toast; additional ingredients are 75 cents each. More places should make this perfectly reasonable concession to common sense. 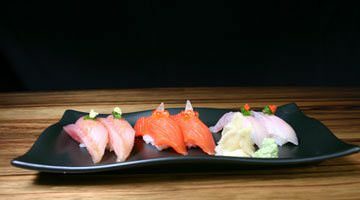 They walk this line between local and fine throughout the menu. The Alameda has goofy stuff like an Alameda B.E.L.T. : cheddar, bacon and hard eggs with lettuce, tomatoes and mayonnaise on sourdough toast. And there’s the Klickitat Omelet with blue cheese, apples and bacon. And there’s a braised mushroom omelet with spinach and Swiss cheese—which you should stay away from unless you love mushrooms. My friend Beth reported that the egg in the omelet was thick, tender and fluffy, but not airy. And they prepare their hollandaise with par cooked eggs; I don’t even know what that means. But then there’s the basic scrambles with cheese, mushrooms and onion; a Belgian waffle that’s only $4.50; oatmeal with bananas, raisins and brown sugar for $4.50; and granola or yogurt with fruit for $5 or $6. And then there’s the French toast. Giving in to their elegant, stylish side, they couldn’t just do French toast; they had to fancy it up somehow. And yet they didn’t do anything too fancy. They make it with thick baguette bread, dipped just enough to hold a crust of cinnamon-sugar crushed corn flakes, then fried so, as Beth said, it looks like pieces of cod. The first time I had this, I wasn’t impressed. I like my French toast soaked, and this is dry in the middle. The second time? Well, now I’m thinking that the cinnamon is a nice touch, the crunch of the crust plays well with the soft bread, the syrup takes care of the moisture, and it reminds me simultaneously of Navajo fry bread and breakfast cereal with Saturday morning cartoons. Clearly, more research is required. By the way, it’s called “Santa Fe Railroad French Toast” because, apparently, the recipe originated on the old Santa Fe Railroad. Whether it’s even French toast at all is in question, I’d say. But I don’t care. I also don’t care why the place tries to be kind of elegant and neighborhoody, either. I’m just glad it’s around. 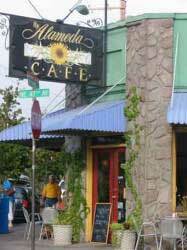 I have eaten at the Alameda Cafe several times, and although I enjoyed my food, I thought their coffee was awful. In a city like Portland there is no excuse for bad coffee, ESPECIALLY at a breakfast place. It’s gotten better in the past few years, but I still choose to order OJ or some other beverage and warn my dining companions. I quite like their breakfasts. The raspberry juice I had there is the best juice I have ever had. Their Klickitat omelet rocks! I crave it’s smoky goodness occasionally and it’s worth the trip across town just to get it. Good to see them get a good review. do we have old money here? where do they eat breakfast? Actually, not anymore. Both Henry Thieles, and the former Mallory dining room catered to the west hills set. This was decidedly another era though. An era when white tablecloths and fresh flowers were considered anything but pompous. OK, so what’s the prejudice against old money? Do you assume all of these people are jerks? Should “old money” people assume all people with an income under $30,000 are jerks? Generalizations sometimes betray a personal bias that may not hold true if you open your self to seeing people as individuals. Glad the restaurant had a good breakfast! I don’t understand the pompous remark. Everyone knows that “New Money” is sooo Tick Tacky……(insert winky, wink emoticon)But…..From my experiences in the biz” New Money” breakfasts are much better. My main problem with new money is that everything tastes like botox and low-interest ARM mortgages. I really appreciate the attention to cheap price tags in your posts. While I love, and drool over all the posts on this website, your posts make it more accesible for all of us who read it. So even though people keep complaining about silly, nitpicky things in your posts I’d like to say kudos to you and to Food Dude for mixing it up a bit. fact is that while this is far from an “old money” town, people will still throw the term around somewhat. this isn’t something i lose the least bit of sleep over. however, that the reviewer has this presumtuous, frankly silly kind of language built into a review speaks to the kind of (all too common) error that makes me want to skip the next one. i don’t need to be aware of the reviewer’s personal predjudices in order to register their opinion about someone’s eggs. while it may be argued that these predjudices shed light onto the rest of the review, my experience in assessing the opinions of others in these food/wine/art matters tells me that they’ll always surprise you & that the less you know about their personal feelings the better. that said, i do wish you the best of luck in your future reviews, sir. i won’t skip the next one. Let’s keep comments at least loosely related to the topic. Based on this review, my sister-in-law, some friends and I ended up at Alameda Cafe for a labor day breakfast. Normally, we would have gone to Helser’s, Gravy, or the Tin Shed, but my out-of-town guest had already been to Helser’s twice, Gravy is closed on Mondays, and the crowd of people waiting outside of the Tin Shed made me itch. I was not impressed with the custom omelette I ordered (chicken-apple sausage, tomatoes, and jack cheese), nor was my sister-in-law with her Klickitat omelette. Both lacked enough cheese to make the omelette stick together, so they were dry and the fillings spilled out. Mine had no taste of cheese, and my sister-in-law said there was no blue cheese at all in hers. The coffee was weak and overpriced, and the service was dog-slow. The fresh fruit was good and plentiful and the orange juice tasty, and I may go back to try the french toast. All in all, though, I wish I’d invited everyone over to my house and put them to work squeezing orange juice while I made Paula Deen’s french toast casserole and a large pot of strong Peet’s. I had high hopes for Alameda Cafe for breakfast one weekend about 2 months ago. We went there with some friends who were visiting. We don’t eat out much these days so we put a lot of effort into researching where to go because the money spent is a high proportion of our budget. I should also mention that I am a person who loves breakfast food more than the next 9 out of 10 people. Unfortunately the meal was one of the worst breakfasts out that I’ve experienced–despite the fact that my food was actually pretty good. The main reason for such a terrible experience was that the service component failed in three ways. My S.O. made a simple request to hold back one ingredient from her order, one which she cannot eat. When our plates arrived, the failure #1 was her request was not honored. So they took it back, and we had the unpleasant scenario whereby three of us ate while she waited for her order to be fixed. Some time later, her order arrived for the second time. Lo and behold, they made a second mistake with her order and this time it had a different ingredient added which was not described in the menu, nor could she eat that. So it went back for the third time. And one of our guests had requested a side order which was never delivered. The wait-person did not offer to give us some item for free to compensate us for the trouble. All in all, there were simply so many mistakes that we could not enjoy the breakfast. As we drove away, we speculated what could have caused such a string of failures. In the end, I can excuse one problem and go back thinking it was a fluke, but three in one visit is a catastrophe… we will simply never go there again. The Alameda Cafe is close enough to my digs to be considered “neighborhood” and thus it frequently is my default restaurant choice. I have had breakfast there only a few times, and every occasion proved to be tasty, if not out-of-this-world spectacular. Service was usually OK for speed, and almost always pleasant, even on crowded mornings. Lunches are my favorite meal there, and I’ve found nearly every item I’ve ordered to be fresh, well prepared and delicious. For me, the big attraction is the fact that the Alameda Cafe keeps “off” hours, like, say, 4pm on a Saturday. I’m not sure why I regularly find myself wanting to eat at such obscure times, but I do, and thus the Alameda Cafe is one of my regular haunts. service was just not good enough. The food was bland and the service was slow. I decided to give it another shot last weekend and revisited the Alameda last weekend. And Wow what a change, who ever is in the kitchen cooking is doing a great job. (I was told there is a new chef). I went with a friend for brunch on Saturday and I had the special gingerbread pancakes it was wonderful. I tried my friends home fries and you could really taste the difference from a year ago. All in all we were extermly pleased with our meal. I was so pleased I went back for dinner on Thursday night. Again I am so happy to hear there is a new chef. I had the Scallops. It was pan seared with a sweet potato and goat cheese ravolis and a bacon vingerette. Yum. My husband had the Crispy Chicken with garlic gnocchi and green beans and mushrooms. It was one of the best meals I have had in a long time. We are so excited that the Alameda Cafe has changed for the good and to finally to have someone who knows how to cook. I completely agree with your assessment, yumyum. We started going there for breakfast when the lines at Milos started getting as long as those at Cadillac Cafe, and we have not been disappointed. Great breakfasts, no lines – shhhhhh, don’t tell anyone!